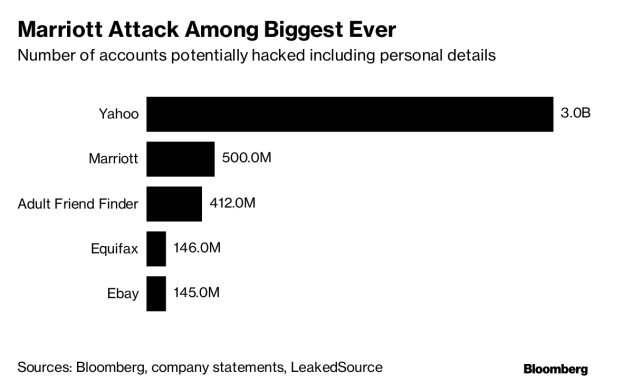 Marriott International Inc.'s revelation of a hack involving the database of its Starwood unit highlights the hidden cybersecurity risks involved with mergers and acquisitions. Marriott acquired Starwood for $13.6 billion in 2016. It announced Nov. 30 it had discovered unauthorized access to information on up to 500 million guests in its Starwood guest reservation database since 2014. Even companies that thoroughly vet their targets can’t entirely avoid the possibility that they’re inheriting risks. Data breaches in a target company’s systems can carry the intangible cost of damage to an acquiring company’s reputation, along with the actual price of discovering and remediating a hack. And companies that aren’t fully aware of what they’re buying can face lawsuits down the road from data breaches that can take years to play out. Marriott determined Nov. 19 that the stolen data contained information from the Starwood reservation database. For 327 million of the guests, that included names, mailing addresses, phone numbers, email addresses, and passport numbers, among other information, the company said. Encrypted credit card information could have been exposed for some guests. Starwood warned customers in 2015 of a security breach of systems that contained credit and debit card data. The announcement came just a few days after the deal with Marriott was announced, cybersecurity expert Brian Krebs said in a 2015 blog post. Marriott didn’t immediately respond to a request for comment from Bloomberg Law. Companies have increasingly been understanding the need to conduct robust due diligence in the deal process. Risk potential has emerged in the past few years as a key issue that can change the course of a deal, alter the purchase price, or destroy it entirely. Companies and their attorneys see strong vetting as an essential part of negotiations. Privacy and cybersecurity issues are “finally being recognized by transactional lawyers as potentially having a huge impact on a deal,” Lisa J. Sotto, partner and chair of Hunton Andrews Kurth LLP’s global privacy and cybersecurity group, told Bloomberg Law. Sotto spoke generally, not about specific companies. Buyers can look into a target company’s past breaches or cybersecurity incidents, assess the company’s data assets, and do penetration testing and vulnerability assessments. Verizon Communication Inc.'s acquisition of Yahoo! Inc. is an example of the price companies can pay for breaches. Yahoo disclosed a massive data breach amid plans to merge with Verizon, resulting in a $350 million drop in the purchase price. Companies are increasingly including explicit cybersecurity provisions in merger documents. Marriott and Starwood’s merger deal, which was inked before the Yahoo breaches were disclosed, did not include explicit provisions about cybersecurity. Since Verizon renegotiated its purchase of Yahoo on the basis of Yahoo’s data breaches, more merger parties have included terms about security, and acquirers now conduct more extensive systems reviews on targets, before closing. —With assistance from Eleanor Tyler.